The Money Tree wouldn't we all just love one of these, especially as the manufacturers of equipment seem to think that money does grow on trees. We were originally commissioned to put this image together for an advertising campaign for The Money Tree Project and here we are going to explain how we created this image for our client. Put TIFF into Photoshop to make further modifications, additions and output. 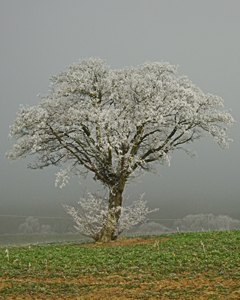 This is the original image, taken on a cold, very frosty but sunny March morning, this coming week two years ago. The grey sky is natural it was the mist of the very frosty morning. 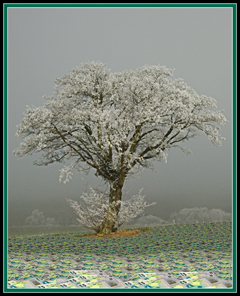 The ground under foot was crisp and crunchy and made a noise as you walked on it and the white of the tree and foliage in the background was the frosty covering. Being March the crops in the field were just starting to come through and gave this green carpet with sections baring the brown undersoil. It was taken with a Nikon D2x and Nikon 24-85mm lens at 40mm ISO 640 1/200th f22. Returning to the office for some editing with Capture NX to enhance the image and resized to the required dimensions before making a TIFF file to further manipulate, add to and output with Photoshop. 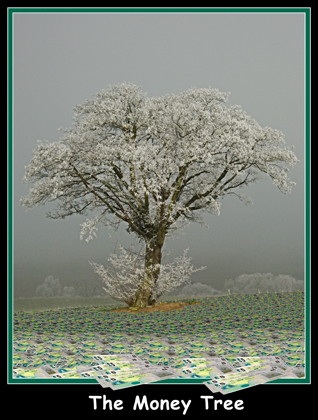 In Photoshop as a separate exercise we created some special £5 notes to use as the ground cover below the tree. You will notice that we have dropped in the picture of the tree into our £5 note which is marked as The Money Tree Bank. Photoshop incidentally thought we done such a good job it popped up a message saying we shouldn't print bank notes! This single £5 was then used to create a pile of three notes which would be used to make the ground cover by placing them at different angles and perspectives within the ground area of the final image. There were several different arrangements of notes so as to get a more random appearance. This was the next stage, using the various layers of £5 notes we created different strips of different perspectives, sizes and layered them towards the front of the image. Those layers at the back being darkened to give a shadowing effect, whilst leaving those closest to the front brighter and larger. This is shown with only four of the layers in place. The final stages to create the main central photograph was to put some larger £5 images at the very front of the picture and clone out the electric cable that was in the background across the image. 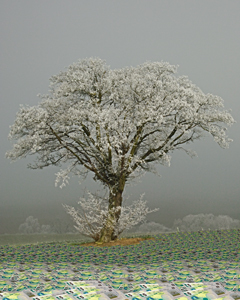 A border was installed around the image to give an art picture effect. Then finally the image was made to exact size by adding extra black background and for the effect of Money falling out of the image a couple of batches of £5 notes were added into the foreground of the picture hanging over the border. The text was then added and this image created as a JPG for you to see here.